Vindication seems to be rolling into my life, little wavelets at a time. For example, the art history textbook I use, the venerable Gardner’s Art Through the Ages, has started acknowledging 1628 BCE as the date for the eruption of the volcano on the Aegean island of Thera—and thus confirming my contention that it could not have been the cause of the decline of Minoan civilization in the mid-sixteenth century BCE. I’ve been complaining to my students for over ten years about the persistent ignoring of the geological evidence by art historians and edutainment profiteers, and now I can crow about it. This is not news to those of us who keep up with the latest info on peak oil and gas, but it was rather nice to read about it in the local rag, even if they did have to pinch it from the Times. In all fairness, I should mention Bloomberg Businessweek’s assurance (“Everything You Know About Peak Oil is Wrong”) that we’re not running out of anything (although the article does point out the rather significant cost of extracting all those abundant “natural resources”). But my fellow skeptics can only chortle when the possibility that the “experts” might be wrong actually becomes news. I've also been bugged for eons by the increasing levels of noise in the world, especially noise imposed on people who are trying to learn stuff. I've tried mightily not to require collaborative efforts on the parts of students, except occasionally in select classes, despite constant insistence by folks trying to assert the latest educational fad. So imagine my glee when splashed all over the Poop this weekend were articles about Susan Cain’s new book, Quiet: The Power of Introverts in a World That Can’t Stop Talking. Not only was there a piece on the front page of the Points section by Cain herself (“When collaboration kills creativity”), but a review in the Books section as well (“Introvert, to thine own self be true”—by MiChelle Jones, to which I cannot find a link anywhere). The vindication aspect is this: I have long preached that thinking (of any variety) requires solitude. In fact, I can only infrequently avoid making snarky remarks about the current fad of walking around plugged into background music. How can one think at all with a sound track? My victims, however, tend to be people in elevators who can't hear me anyway, so I don't usually blow my introvert cred. I’m one of those folks who listens to music for enjoyment, and when I do so, it’s without other distractions. I listen without other stuff going on. I require a good sound system and decent recordings. So I rarely have the radio dial tuned to the local Classical station (except for pledge time on public radio; I’ve already given, thanks), preferring to hear commentary and news on the road. When I want to think in the car, the radio goes off. I abhor second-hand music—other peoples’ choices that drift through the air toward me from a car parked across the street or some other venue. Woe betide the innocent who tries to play music in my office, because I will assert myself and ask him or her to turn it the hell off. Consequently, I laughed out loud when I read this in Cain’s article: “ . . . The New Groupthink has overtaken or workplaces, our schools and our religious institutions. Anyone who has ever needed noise-cancelling headphones in her own office . . . knows what I’m talking about.” At the beginning of this quarter I brought my Bose headphones, purchased at an airport years ago to escape from airplane noise, to my office, and cleared out a space in my overhead bin (we have carrels, not cubicles) to give them pride of place. They’ve twice so far kept me from wanting to throttle someone. Perhaps the moral of this story is that one of the advantages of age is the vindication factor: live long enough, and someone might well appear in some public sphere to tell you you’ve been right all along. Image credit: my apologies to the two people who took the photos I mashed together for this cartoon, and donated them to Wikimedia Commons. 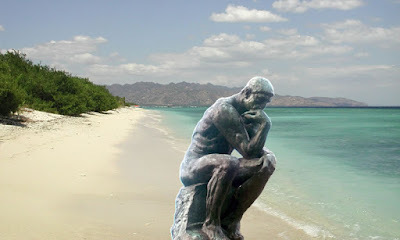 The Thinker, by CJ, and Gili Meno West Coast by Davenbelle.